"Raging Bender" is the twenty-first episode of Futurama, the eighth of the second production season and the twelfth of the second broadcast season. It aired on 27 February, 2000, on Fox. It guest-stars Rich Little as himself in a jar. After accidentally beating up the Masked Unit, Bender becomes the new favourite at Ultimate Robot Fighting League. 1.1 Act I: "Just walk around not wearing a helmet"
1.2 Act II: "Bender the Offender"
1.3 Act III: "It's Bendering Time!" Act I: "Just walk around not wearing a helmet"
Hermes returns from his vacation and seems to have acquired a unique souvenir: a Brain Slug. As the rest of the crew wants to evade any possibility of assimilation, they all go to the movies. After some discussion, they decide to see All My Circuits: The Movie. Bender is angry about another robot with an exceptionally high head sitting in front of him and teases him continuously, until the stranger's patience is exhausted. He changes into a fighting monstrosity and chases Bender across the theatre, but when he has him cornered he slips on Bender's dropped popcorn (with extra motor oil) and is knocked out. It turns out the stranger was The Masked Unit, a member of the Ultimate Robot Fighting League. As it happens, the Commissioner of the URFL is present and enrols Bender on the spot to fight in the League. Act II: "Bender the Offender"
Bender is very proud of being a member of the league, until he learns that Ultimate Robot Fighting is the most brutal form of competition in the galaxy. He wants to chicken out, but Leela stops him from doing it and tells a story about her youth in the orphanarium. When she was training Arcturan Kung Fu, she had a sexist trainer, Master Fnog, who deemed her inappropriate for championship because she was female, because women lacked the "Will of the Warrior". She wants Bender to seize his chance to be a champion and takes on the task of training him up for the big fight. 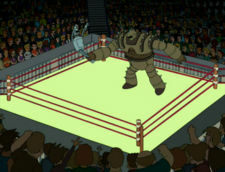 At his first big night, Bender wins the fight after a bad start and against his expectations, and is told afterwards that all the fights are rigged and the most popular robot wins. As Bender is not only popular, but lowest-common-denominator, a great career starts. As Bender the Offender, he easily knocks out every fighter of the league, and as he knows the secret of success, he neglects his training, to the dismay of Leela. As his popularity drops, however, the league changes his persona to The Gender Bender and orders him to lose next week's title match. As his opponent is the robotic armoured tank Destructor, Bender reluctantly agrees, but he begs Leela to help him win this fight. At first, she refuses because Bender didn't want her help earlier, but as she learns that Destructor's trainer is none other than her tormentor Fnog, she is eager to train Bender and teach him to fight like a girl. Act III: "It's Bendering Time!" The great title match takes place at Madison Cube Garden, with commentaries by Rich Little and George Foreman. Fnog is making his little jokes, making Leela even more determined to beat him somehow. The fight does not go well, as Destructor is punching Bender at will and without remorse. Leela finally gives in and calls for Fnog to call his pupil off, then notices that Fnog has disappeared and a little antenna has taken his place. She locates Fnog under the ring, wearing a cybersuit that makes Destructor mimic his exact movements. She is enraged, especially as he teases her again, and attacks him. However, Fnog manages to take the offensive and is just about to deliver the final blow. Leela blocks that punch and manages to divert his fist to the ground, and accordingly, Destructor does the same. The fist goes through the floor of the ring and knocks Fnog out. As he falls over, so does Destructor, flattening Bender in the process - Bender has lost the fight. But Leela is still proud of him, as she got to beat up someone who hurt her feelings in high school. This is the second time Hermes has been attacked by Brain Slugs, the first being a brief attachment in "A Head in the Polls". Leela uses Rust-O-Leum to prepare Bender for his first fight. Near the end of the episode when Amy says "Fry, where's your brain slug? ", her voice is a bit lower than it usually is. According to the DVD commentary for this episode, Hermes was supposed to have the brain slug on his head starting with this episode and continuing to the end of the season, but the writers didn't think it was a good idea. It Came From Planet Earth had already appeared in "Fear of a Bot Planet". The term Smizmar is first used here, although its meaning is not established. The newsreel mentions the "newly crowned Miss Universe". She was crowned two episodes earlier, in "The Lesser of Two Evils". The fact that Fry's brain slug starves to death suggests that the brain slugs feed off of the Delta Brainwave. The commentary for the episode makes it clear that the reason Fry's brain slug dies is because he is so stupid. The missing brain wave has no effect. Destructor continuously changes size (seen through comparisons) throughout the episode. The title caption says that Futurama is "Nominated for three Glemmys", an allusion to the Emmy Awards. The movie theatre's name is Loew's aleph-null-plex, including the aleph-null mathematics symbol. Planet of the Clams is a reference to Planet of the Apes about "an upside down world where lobster is slave to clam". Galaxy Wars is a parody of Star Wars Episode I: The Phantom Menace. Quizblorg, Quizblorg, a foreign film with subtitles. Probably a reference to Rochelle, Rochelle, a fictional film often referred to in Seinfeld. When a Man Loves a Smizmar, a reference to When a Man Loves a Woman. Also, a Smizmar is a term used in Kif Gets Knocked Up a Notch to describe the person who caused the feelings allowing a male of Kif's species to become pregnant. Shaft on Africon-9 is a spoof of Shaft in Africa. The opening of All my Circuits: The Movie is similar to those of James Bond films. The robots who tell Fry not to speak during the movie are Tom Servo and Crow T. Robot from Mystery Science Theater 3000 (the irony being that these two are known for talking throughout movies). The Ultimate Robot Fighting is a reference to the UFC, in name, although the actual product is much more similar to professional wrestling, given the characters, ring, merchandising, character changes and predetermined outcomes that are shown. The characters who serve as Bender's opponents are typical of many professional wrestling characters. Bender's change to the Gender Bender bears a passing resemblance to Gorgeous George, one of professional wrestling's first "gimmick" characters. The robo-wrestler that the Masked Unit melts during the old-timey newsreel is called "Gorgeous Gonks", whose name, build, and outfit also resemble Gorgeous George. "RobotMania XXII" is a parody of WrestleMania. "Bender 3:16" is a parody of a popular wrestling catchphrase "Austin 3:16", which in turn is derived from the Biblical reference John 3:16. Rich Little is commentating at the Ultimate Robot Fighting matches and doing an impression of Howard Cosell. George Foreman is the co-host and makes reference to his George Foreman Grill. Crow T. Robot and Tom Servo from Mystery Science Theater 3000 (MST3K) appear in silhouette in the movie theatre (as they normally do on their TV show). Crow telling Fry not to talk during the movie is ironic, considering that MST3K is famous for having Mike (or Joel), Tom Servo, and Crow say sarcastic things during low-budget movies. The ad announcing Bender's persona change to "The Gender Bender" starts with Bender standing on the planet Earth with an Old Freebie flag waving behind him. This pose is identical to the George Reeves Superman pose at the start of each episode of the 1950s television series The Adventures of Superman. Hattie says "let's all go to the lobby", a reference to a 1953 animated musical snipe by that name encouraging theatergoers to visit the lobby and purchase drinks and snacks. Whilst fighting Destructor, Bender adopts the Jin Ji Du Li (golden rooster stands on one leg), also known as the crane stance. This is used in several martial arts as well as by the title character of The Karate Kid. Bender the Offender/The Gender Bender. The Masked Unit, a parody of The Masked Superstar. Gorgeous Gonks, a parody of Georgous George. The Clearcutter, a parody of "Hacksaw" Jim Duggan. The Foreigner, a parody of wrestlers such as Iron Sheik, whose main gimmick is being un-American. The Chain Smoker, a parody of The Sandman. Billionaire Bot, a parody of "The Million Dollar Man" Ted DiBiase. Sgt. Feces Processor, a parody of Sgt. Slaughter. Destructor, a Robotic armour-tank, whose use in battle has been ruled a war crime. Professor Farnsworth: Good news, everyone! I've taught the toaster to feel love. And Hermes returns from his vacation today. Hermes: [With Brain Slug on his head, monotonously.] Good morning people. Amy: So how was the Spleef Nebula? Hermes: The flight had a stopover at the Brain Slug Planet. Hermes liked it so much he decided to stay of his own free will. Fry: Hermes has all the fun! [He notices Brain Slug.] Wait a second! He's got a Brain Slug on his head! Leela: Shhh! You're gonna get us all assimilated! Amy: Just act normal and switch to a garlic shampoo. Hermes: On to new business. Today's mission is for you all to go to the Brain Slug Planet. Zoidberg: What are we going to do there? Hermes: Just walk around not wearing a helmet. Bender: Float like a floatbot, sting like an automatic stinging machine! Bender: Let's commence preparations for rumbling! Leela: No, you've got to do it. I don't care how suicidal it is. Fry: Hey, how come that when I want to do fun stuff that will kill me, you're against it? Leela: This is more important than that marble eating contest, Fry. Bender: You mean I'm not a great fighter? I just won cause I'm popular? Commissioner: In fact, you're more than popular - you're pure lowest common denominator! Bender: Go Bender! Go Bender! Go Bender! Fry: Man, I thought Ultimate Robot Fighting was real, like pro-wrestling, but it turns out it's fixed, like boxing. Destructor: I will destroy you! YAAARGH! And stop calling me! Fnog: You were an excellent student. Too bad I was a lousy teacher! The Foreigner: [Taunting the crowd.] I am not from here! I have my own customs! Look at my crazy passport! Bender: It's one thing to win a fixed fight there's dignity in that. But to lose? And in this atrocity? I can't do it! Leela, you gotta train me to win. Leela: No way! If you wouldn't take my help when you didn't need it, why should I give it to you now when you do need it? Professor Farnsworth: What the hell are you talking about? Leela: I don't know. But I'm not helping. This page was last edited on 14 April 2017, at 03:50.